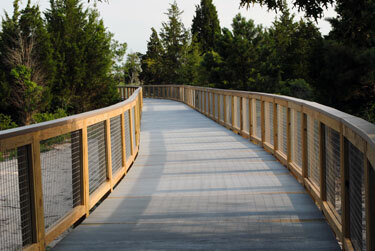 Cape Henlopen State Park near Lewes, Delaware, recently underwent a revitalization project ensuring that avid nature lovers can fully appreciate a 15-mile regional trail system connecting Lewes and Rehoboth beaches. Prior to this revitalization, the Gordons Pond Trail was unprotected, unmarked and primitive, making it difficult to navigate. This revitalization effort finally gives officials, conservationists, naturalists and recreational tourists the chance to explore and appreciate the beauty of the area. This high profile project utilized almost half a mile (made up of close to 5,000 panels of Strongwell’s fiberglass grating) as part of the Gordon Pond Trail. 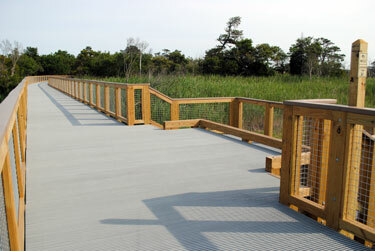 The elevated trail path design allowed designers to incorporate two observation lookouts overlooking the pond, tidal marsh and dunes. Due to the site’s proximity to the ocean, corrosion and light penetration were factors in deciding which building materials to specify. The contractor, Conventional Builders, Inc., along with the State of Delaware, decided a durable and maintenance-free grating was the ideal choice. Approximately 19,900 square feet of Strongwell’s lightweight but extremely strong DURAGRID® I-4000 1” thick grating was installed. Some of the grating had to be transported nearly half a mile without the aid of any heavy equipment to ensure that rare plants, animals and archaeological sites were undisturbed during construction. The revitalization effort has clearly paid off. Cape Henlopen’s new trail at the park has received close to five hundred positive peer reviews on Trip Advisor and is a recent recipient of Trip Advisor’s Certificate of Excellence.